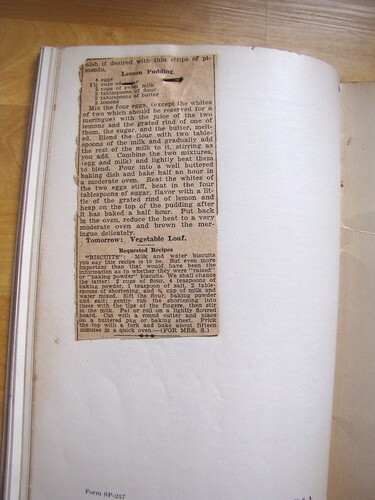 This clipping was pinned in the back of my 1930 Silent Hostess Treasure Book cookbook. Mix the four eggs, (except the whites of two which should be reserved for a meringue) with the juice of the two lemons and the grated rind of one of them, the sugar, and the butter, melted. Blend the flour with two tablespoons of the milk and gradually add the rest of the milk to it, stirring as you add. Combine the two mixtures, (egg and milk) and lightly beat them to blend. Pour into a well buttered baking dish and bake half an hour in a moderate oven. Beat the whites of the two eggs stuff, beat in the four tablespoons of sugar, flavor with a little of the grated rind of lemon and heap on the top of the pudding after it has baked a half hour. Put back in the oven, reduce the heat to a very moderate oven and brown the meringue delicately. 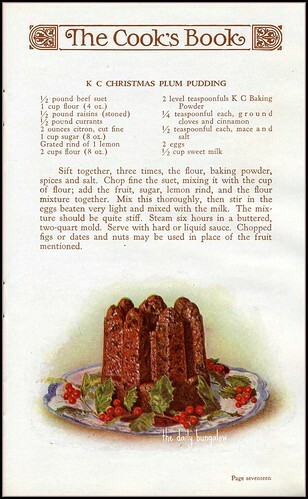 The clipping is undated, and there is no indication as to the source, but the references to a “moderate” and “very moderate” oven (and to a “quick oven” in the recipe that follows) mark it as being relatively old. A moderate oven is about 350 degrees F. Very moderate is probably about 325 (most conversion scales don’t list “very moderate”, but the recipe does say to “reduce the heat”). A quick oven is about 375-400 degrees. You can find a conversion chart for these old-fashioned temperatures (and measurements) here. The back of the clipping, unfortunately, does not tell us where or when it came from. It is part of an ad for a rayon bedspread, shown on a very old-style bed. My guess is that it is contemporary with the cookbook itself. Rayon was already known and used by 1930.